When Colin Kaepernick chose to sit during the playing of the national anthem in August 2016 he did so in protest. “I’m not going to stand and show pride in a flag and for a country that oppresses black people and people of colour…There are bodies in the street and people getting paid leave and getting away with murder” he said. He spoke in reference to the approximately 309 black people killed by police in the United States in 2016. His protest, first sitting, and then kneeling, during the national anthem was soon joined by others across professional sport. This quiet protest was allowed despite public and internal outcry. To be a person of colour and a professional athlete in the United States means occupying an inherently political space. Donald Trump’s comments last week in Alabama brought the kneeling protest of NFL players into the forefront of media debate. The language Trump used to describe an unnamed player who knelt during the national anthem as a “son of a b*tch” who should be “fired” for being unpatriotic and disrespecting the flag was at the centre of the debate. 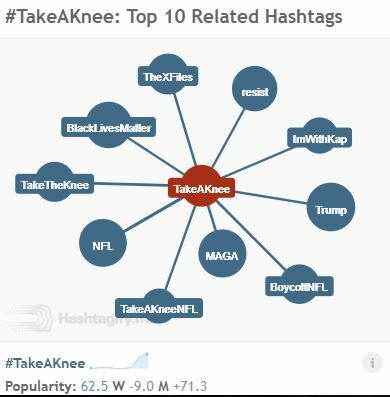 Soon, #takeaknee and #standfortheflag were trending on Twitter. Few things are as American as football, and the idea that the president would urge for a boycott of the entire NFL over what he framed was an ‘unpatriotic’ act by a few players was divisive. Trump’s strawman dismissal of the racial aspect of the kneeling protest in favour of the ‘unpatriotic’ narrative is the same rhetorical device used in comment section arguments online. In his book about blogging, Cass Sunstein speaks of cybercascades. They are, he states, a process by which information encourages a certain point of view to become widespread, simply because so many people believe it (Sunstein, 44). Twitter is blogging on a micro scale, but Sunstein is right; belief in the validity of an idea comes in volume on Twitter. Donald Trump has 39.5 million Twitter followers; and if one uses the free service Twitter Audit, one can determine that approximately 63% of those users are real. Trump’s ability to cascade information reaches approximately 24.8 million “real” users on Twitter alone. The office of the American president has historically been viewed as trustworthy, and what Donald Trump says – and tweets – is news. It contributes to the cacophonous echo of the 24-hour news cycle. The work of Neil Postman has returned to the conversation following Donald Trump’s election, with commentators wondering about Postman’s hypothesis about the American capacity to think, given the American penchant for distraction. Trump, and his informational cybercascade on Twitter, has served as a noisy media distraction from the central issue of Kaepernick’s protest. 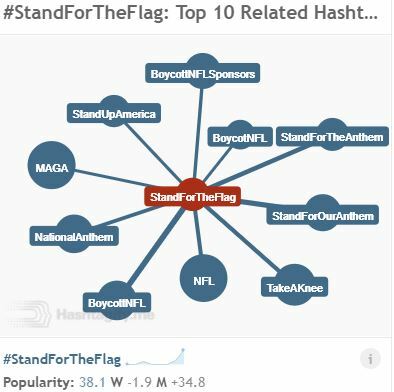 Following Trump’s lead, utilizing the opposing #takeaknee and #standfortheflag hashtags, Twitter users engaged in debate about what kneeling meant in relationship to patriotism and respect for the American flag, proving Sunstein’s point that if enough people blog (tweet) about something, it becomes believed. With that reinvention of truth, Kaepernick’s original reason for kneeling, police brutality, was lost in the chatter of hashtags associated with the protest. #Resist and #TheXFiles are most closely associated with #takeaknee, as well as #saturdaymorning. The disorganized nature of the associated hashtags shows a lack of narrative unity in response to Trump’s cascade. Sunstein points out that at a certain point during a cybercascade, people stop relying on their own thoughts and simply act on the “basis of the signals conveyed by others” (Sunstein, 84). David Duchovny’s tweet demonstrates this with its lack of commentary or engagement with the protest. The counter #standfortheflag hashtag organises far more closely with the reframed debate. With #GodBlessAmerica and #BoycottNFL (and their variants), as well as the ever-present #MAGA, most closely associated with #standfortheflag it is easy to see how Trump can cause his Twitter follower base to mobilise and repeat his message. 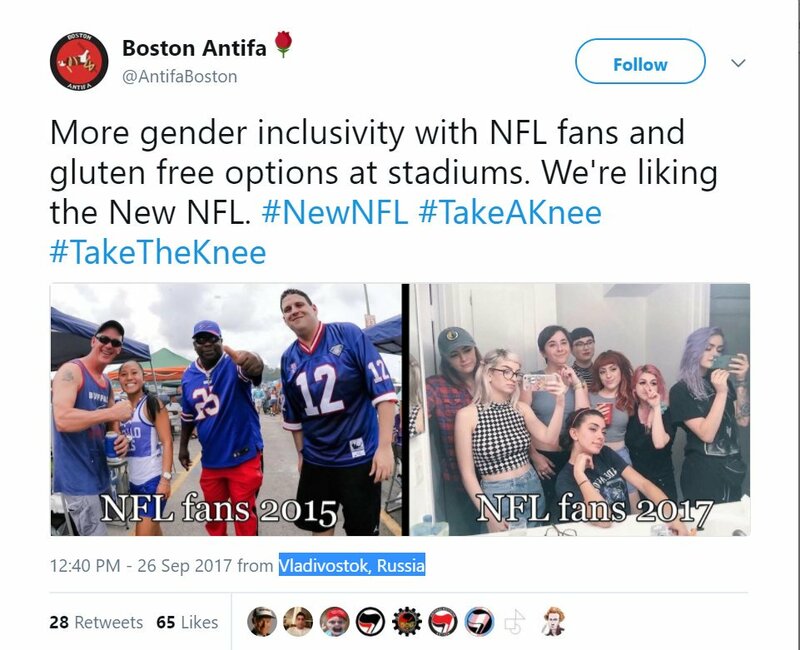 Helped along, as @commondefense points out, by Russian propaganda bots. The presence of third-party actors “trolling harder” behaviour due to encountered resistance from the #takeaknee camp further assists in this fragmentation (Philips, 24-26). The troll is the repeating element, the looping hook used in the overplayed iPhone commercial, in Trump’s cybercascade. It furthers the concern that many of those who engage with Trump, his hashtags, and the #MAGA network on Twitter are not real at all, but rather bots adding to the background chatter to ensure that the original cascade becomes truth. In his work Bowling Alone, Robert Putnam expands on this debate further, speaking to the dependence on relationships of trust and reciprocity (Putnam, 27) in order to create a civil society. Twitter, one could argue, erodes those trusting, reciprocal relationships by engaging in what Sunstein warned was a tendency towards like-minded individuals to contribute toward fragmentation in online spaces (Sunstein, 145). The Atlantic recently asked why Americans are post-truth. “The short answer is because we’re Americans—because being American means we can believe anything we want; that our beliefs are equal or superior to anyone else’s, experts be damned” (Andersen). Donald Trump’s believes his views are superior to everyone else’s. He cascaded his version of the truth, reframing protest about police violence into a debate about patriotism. And, in reaction to his doing so, the NFL and media response sanitized the kneeling protest, silencing Kaepernick’s original protest into something clean and all-inclusive. Andersen, K., 2007. How America Lost Its Mind. The Atlantic. September 2017. Accessed 29 September 2017. Phillips, W., 2015. This is Why We Can't Have Nice Things: Mapping the Relationship Between Online Trolling and Mainstream Culture. Cambridge: The MIT Press. Putnam, R., 2000. Bowling Alone. New York: Simon and Schuster. Sunstein, C., 2009. Republic.com 2.0. Princeton: Princeton University Press.